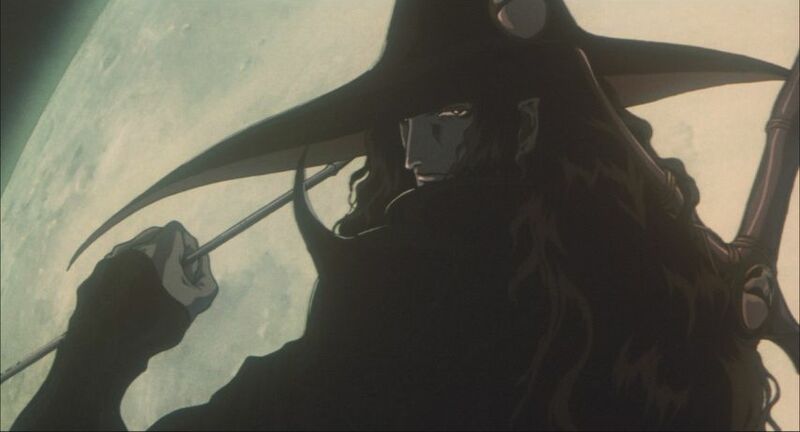 The most pleasant surprise of Vampire Hunter D: Bloodlust is not just how much of an improvement it is over the original Vampire Hunter D film, but how much it also improves upon its own source material. It’s an uncontested triumph on a technical level, and for most viewers that might well have been enough, but director and screenwriter Yoshiaki Kawajiri wisely regarded the source material as just that — source material, not a strait-jacket — and added some emotion to go with the eye candy. Most of the D novels are dark-fantasy pulp, more concerned with wringing mileage out of the bizarre setting (Hammer Horror + Wild West + Steampunk) and less interested in characterization or deeper themes. D himself, the half-vampire hunter always at the epicenter of the action, is little more than our mostly-silent tour guide through his bizarre world. The first book, the source of the original film, served to do little more than establish D and the setting; the movie derived from it did little more than put its action beats up on the screen. Book #2 (Raiser of Gales) had more character and concept to burn, so the straight-up action of #3 (released in English as Demon Deathchase) felt like a step backwards. Bloodlust starts in more or less the same place as Deathchase, but it ends up many miles farther along. Like the previous film, Bloodlust drops us into the movie’s setting with little more than a few title cards and some gloriously moody imagery to get us prepped. D, still seeking out and slaying the world’s remaining “Nobility” (vampires), is hired by the father of a young woman named Charlotte, who has apparently fallen under the spell of the vampire Meier Link and been borne off by him into the night. Dad wants Charlotte back, dead or alive, and it wouldn’t hurt to have Meier dead as well. But Charlotte’s older brother has also dropped a fair amount of gold to send another bounty hunter team after her: the infamous Marcus brothers, the sort of mercs more than happy to grease D if he gets in the way. Charlotte, however, is no victim. She and Meier are in love, and she’s willingly accompanying him to whatever solace the two of them can find together. Meier is also a formidable opponent, able to hold off D even without the gamut of retro-future technology he has at his command, but he’s not alone — along the way, he picks up three members of a secret society of half-demon offspring to protect him from both D’s sword and the Marcus brothers’ arrows. That said, the Marcus boys have two aces up their sleeve. First is the youngest and most physically frail of the brothers, who has an astral-projection trick that might well even the odds in most any fight — especially when the competition consists of creatures like a demon that can melt into and out of the shadows. Second is the the odd woman out from the Marcus clan, their adoptive sister Leila. She’s as tough a cookie as the rest of them, brooking no guff from either her brothers or any man (or non-human) that gets in her way. She goes so far as to shadow D when the latter (thanks to the gravel-voiced parasitic beast living in his left hand) sniffs out where Meier’s carriage has been parked for the evening, the better to take out D with one good blast from her portable cannon. When Leila’s downed by a bullet and patched up by D, against Left Hand’s better judgment, she borders on taking it personally. The last thing she needs is to be saved by some halfbreed — and one who’s competition, to boot. But that act gives her just enough perspective into D’s mind — even a “bad” human is better than a “good” vampire — to return the favor later when D succumbs to overexposure and has to bury himself neck-deep in earth to recharge his supernatural batteries. Turns out they’ll need to pool their resources to bring Charlotte back, especially as she and Meier find shelter with another member of the Nobility — one who might be able to put them out of the reach of D, the Marcuses, and Charlotte’s family forever. 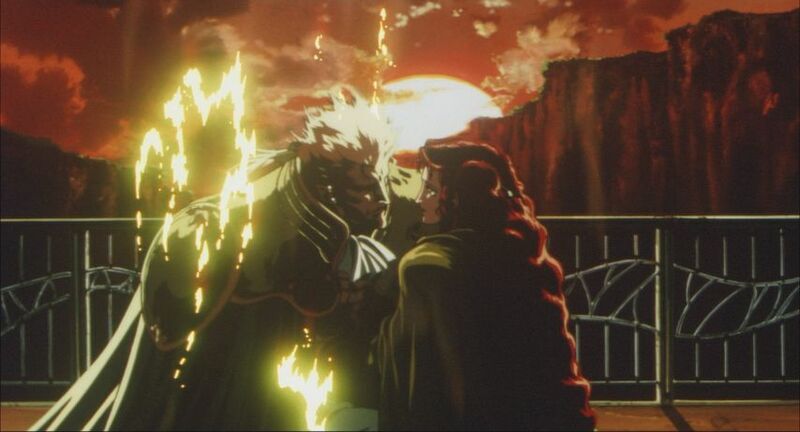 Too often I get so wrapped up in talking story and theme with anime that I forget to talk about the animation part of the anime, and not talking about the animation in Bloodlust is like not talking about the colors in a sunset. There’s barely a shot that doesn’t dazzle in some way, and the fluidity and detail of the animation (sometimes with a digital assist, mostly not) are best appreciated on a big screen. The Blu-ray Disc reissue of the film goes a long way towards fixing that, and more than makes up for the limitations of the earlier home video releases, but the bigger the screen you can see it on, the better. When the Brothers Marcus and D cross paths, it’s by way of a moment that seems custom-made for such viewing; Marcus brother Borgoff fires a crossbow bolt at D, and he snatches it out of the air while framed against the full moon. Kawajiri is something of a polarizing figure, and I have myself gone both ways on his work. 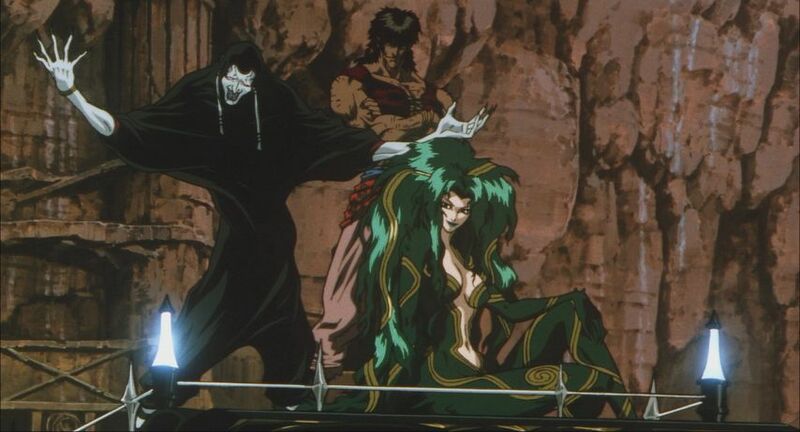 I admired Ninja Scroll for its design work and amazing visuals, but deplored the misogynist-chic elements that stemmed from its roots in pulp fantasy. 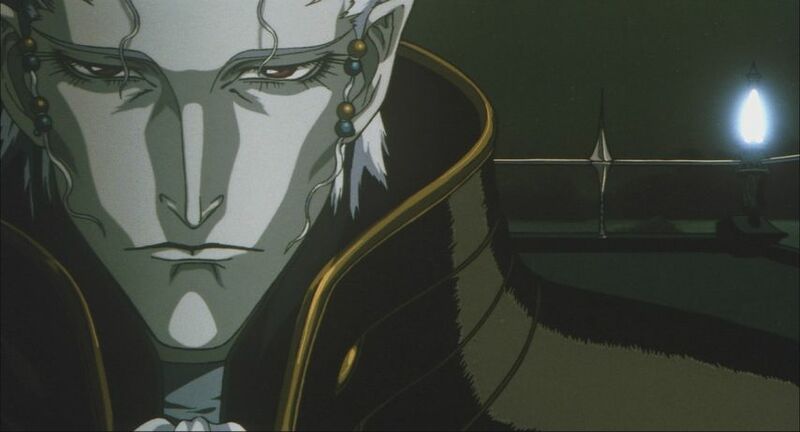 Bloodlust is less problematic that way, although it accentuates another reason for split decisions on Kawajiri: his peculiar, elongated character designs. They’re a turnoff for some, but I find them arrestingly offbeat, and here they are a fitting complement to Yoshitaka Amano‘s original design work for the character. 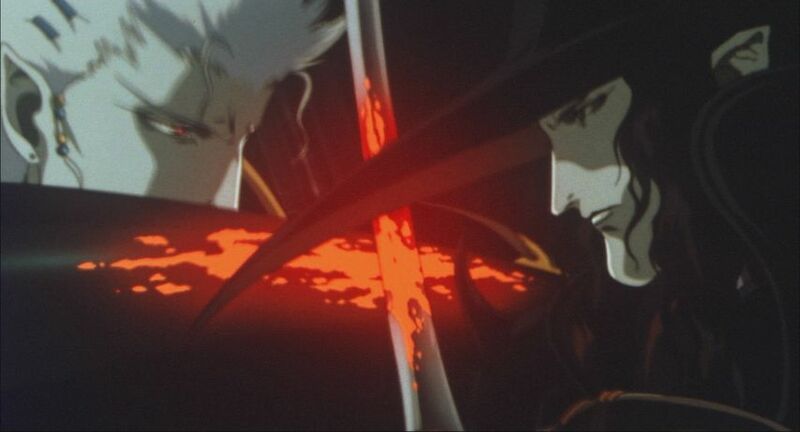 The original film didn’t capture any of the flavor of that imagery, and while Bloodlust is still clearly Kawajiri’s work rather than Amano’s, it’s still miles better as a realization than the earlier film. Most of the talk around a movie like Bloodlust begins and ends with the imagery, the animation, the action sequences, the inventiveness of the violence, etc. I am tempted to stop there myself, but at the risk of omitting discussion of things that hit me the first time around — mainly, the way the final fourth or so of the film branches off drastically from the original story and is all the better for it. In that final quarter, Charlotte and Meyer Link find refuge in the castle of Carmilla, a vampire with ties to D’s own past, and a private launchpad from which Meyer Link may be able to find refuge (in what I presume is a space station that looks like a cathedral in orbit). But — spoilers! — Carmilla is nothing more than a spirit hungering to find a new body, and all who enter her domain, D and Leila included, find themselves staring into the mirrors of their own psyches. Cheesy as it all may be, it one-ups the book by providing the entire cast with more and better things to grapple with than the original climax. Another thing the movie does well is expand on the book’s few existing themes about how the characters mirror each other, and how that’s used to push the audience’s sympathies against the grain of the film’s setup. 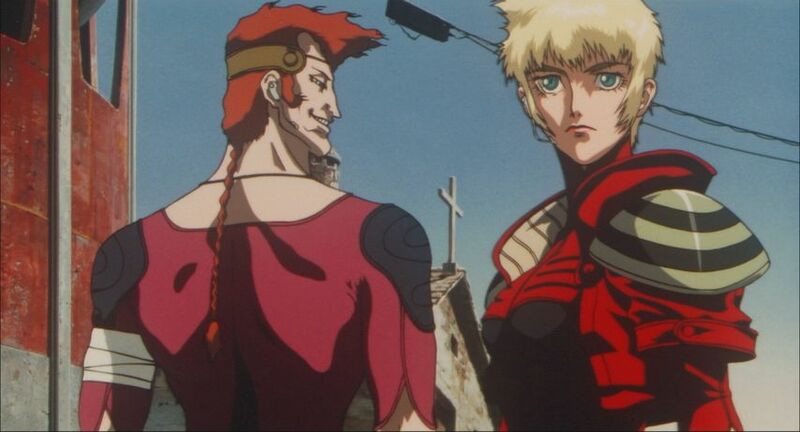 Charlotte and Meyer Link wind up being the most sympathetic characters in the film; all they want is to be together, and Meyer is clearly taking this course of action against the instincts of his thirst for blood. Left Hand echoes the same sentiment when D bandages up the unconscious Leila; he understands his host well enough by now to know any action D takes that puts him that much closer to another human being, also puts him that much closer to a potential victim. Some hint of how D manages not to succumb comes through when he and Leila take refuge from their pursuers and discover they have a good deal in common. From what D sees, it’s that neither of them had the chance to enjoy a life that didn’t involve the taint of vampirism in some form. That her family was destroyed by vampires, and that he is the son of one himself, is to him more about being two manifestations of the same phenomenon than about two competing miseries. Leila is hesitant to recognize it as well; what’ll she say to her brothers? But then again, they are only her brothers in name, and maybe what she can share with someone like D comes from a different place. Less convincing, though, is Leila’s change of heart about her career when she comes across Charlotte towards the end of the film. The way it’s dramatized doesn’t feel properly connected to everything that came before, and more like a moment of programmatic emotional convenience slotted in by a screenwriter. I did appreciate the movie ditching the ugly incestuous overtones of her relationships with her adoptive brothers — something I guess added to the story as a cheap way to make her connections with them all the more easily broken, but all it does is add seediness. Where the movie remains faithful to the book in a positive way is in the action sequences, even when they’ve been simplified or streamlined for the sake of running time or plot complexity, they still land well. I particularly liked the animation flourishes around D’s battles against Meyer Link’s supernatural bodyguards — especially the shapeshifter Caroline, who can one-up the T-1000 by merging with any substance she touches — like, oh, the Marcus’ battle tank. And the climactic clash is at least as pretty for the mutant-Gothic architecture that backdrops it as it is for the battle itself. It wouldn’t be an exaggeration to say most of Bloodlust is made out of such moments of dazzle, stitched together end-to-end with whatever excuse for a storyline was scraped from the source material. 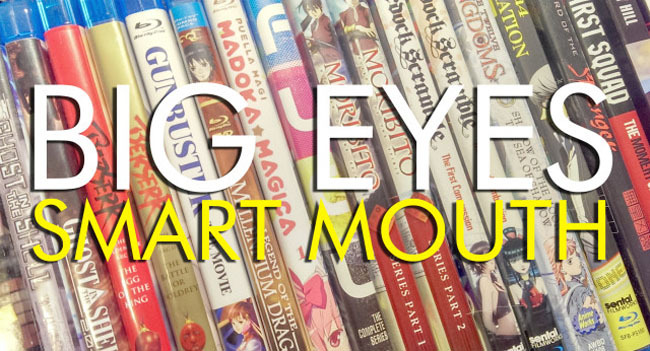 But as with REDLINE — another mix of dazzle and heart — there is more if you look for it, and it brings the story full circle in a way that the original novel only nodded towards. That includes the closing scene, another addition not found in the book, where we learn that one of the benefits of immortality is the way it allows mere mortals to be remembered all the more.